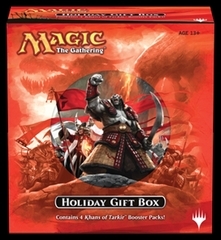 ‘Khans of Tarkir’ Holiday Gift Box is Here! Pretty awesome, right? What are you waiting for? Pick up your copy of this limited edition Magic the Gathering product TODAY! Konami plans to release two new boosters for the Yu-Gi-Oh! 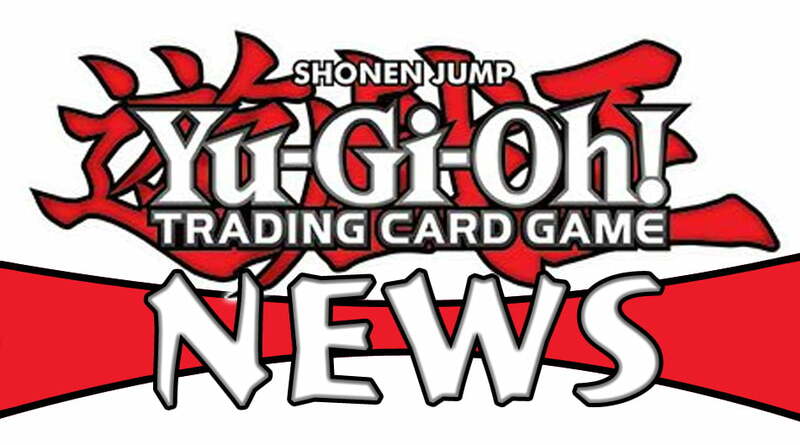 TCG this spring: Yu-Gi-Oh! Premium Gold will release on March 28, and Yu-Gi-Oh! Dragons of Legend will release on April 25th, according to ICv2.com. The Premium Gold booster takes the best cards from the past Gold Series sets and adds new cards to the mix, as well as introducing the new “Gold Secret” card rarity. “Gold Rare” cards, which “enshrine” the cards in a gold color (gold card frames, gold art boxes frames, gold text box frames, card names and even gold level stars for Monster cards), have been available in a number of hobby exclusive Gold products in the past. 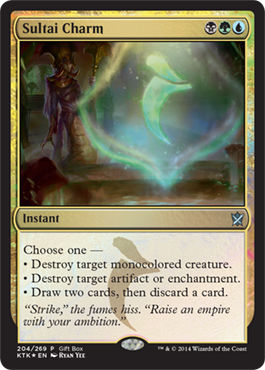 The new “Gold Secrets” cards include all those upgrades and add a Secret Rare Card’s textured foil pattern on top of it. Each 5-card “Premium Gold” mini-pack contains two “Gold Secrets” (either a brand new card, or one of the Legendary Gold Cards from the original Yu-Gi-Oh! series). Each mini-pack also contains three standard “Gold Rares” (one card a never-before released Gold Rare, plus two past “Gold Series” cards). Each Premium Gold box contains three mini-packs (for a total of 15 cards: six “Gold Secrets” and nine “Gold Rares”). The final name and release date are still tentative, but Konami has also posted information on the Dragons of Legend booster, which it plans to release in April. Dragons of Legend will include dozens of the most popular and fan-requested cards that have been used by duelists on the shows (including the original Yu-Gi-Oh! TV series, Yu-Gi-Oh! GX, Yu-Gi-Oh! 5D’s, and Yu-Gi-Oh! Zexal) — all in print for the first time ever. The 5-card packs will contain one “Secret Rare” and four “Super Rare” cards. The Premium Gold booster will follow the Cyber Dragon Revolution Structure Deck and the Star Pack 2 which release in February. 2013 was a big year for Battleground for a variety of reasons. The largest event for the store was definitely the transition from our old location at 1501 Bedford Street to our new location at 1423 Bedford Street. We began the year with the doors opening to our new spot and it was all we had hoped it would be (and more). The increased amount of floor space and the cavernous ceilings changed everything for us and allowed us freedoms we never had before. Another big change was the intense focus we placed on the growth of our online store, and its merging with the Abington location. The community response to the benefits of having such a deep and organized inventory of Magic singles to buy from is overwhelmingly positive. In the coming year, you can expect the online options to grow exponentially; both in terms of our inventory and our stock levels. Furthermore, the addition of Chris Alexander to the Battleground team as our online store manager puts us in a great position to really grow that part of our business. Chris has lots of experience and a strong understanding of the Magic: The Gathering brand. The few months he’s been with us have already resulted in some exciting changes to our online presence. We are fortunate to be a part of a wonderful period of increased popularity in gaming. There are many reasons why this renaissance seems to be occurring, but clearly, board games are a huge part of it. More and more families and groups of friends are realizing the incredible amounts of fun to be had by getting together to play tabletop games. The quality and depth of these games also continues to improve all the time. The presence of these once eclectic games in some of the big box stores is a clear indicator that their popularity is on the rise. What’s more, the popularity of Magic has also soared to new heights. Battleground set record attendance numbers at both of our two locations this past year, and the brand is stronger than ever. This is great news not just for Battleground, but for every single person invested in this hobby. It means that in 2014 we’ll be seeing even more great product from the best games designers in the industry. In 2013 we also celebrated the 10 year anniversary of Battleground. The actual date of our 10 year anniversary was November of 2012, but we wanted to wait until we were moved and settled into our new location before throwing the party. The event was amazing, very well attended, and packed front to back with games, games, and more games. We gave away some big prize packages and were able to say thank you to all of you who have been with us from the beginning, or have just joined our family recently. We can’t do this without you, and we want you to know how much we appreciate your support and participation in making the Battleground community one of the best in the region. I’m excited to see how many new friends we’ll meet in 2014. And speaking of 2014, there are rumblings of big things to come, both from the industry as a whole, and from Battleground. I expect that role-playing games will have another big surge this summer with the release of the next edition of Dungeons & Dragons. Personally, I’ve been following the news and rules tests very closely and it looks like they have a great game on their hands. D&D is the game that brought me to this hobby some thirty years ago and I’m very pleased to see the direction Wizards of the Coast is taking this latest installment. If you’ve always wanted to try getting into RPGs but have never taken the plunge, this is probably going to be your year. Both Battleground Games & Hobbies locations will be hosting some great RPG events in the coming months. Warmachine and Hordes have also seen a huge rise in interest, while Warhammer 40K continues to be a major player. The Battleground community recently came together and created an excellent supply of quality terrain to be used specifically with Privateer Press’s flagship games. In addition, Paul Gaughran also lent us his terrain-building skills over the summer, churning out an uncanny amount of well-painted, ruined buildings in short time. There are plans to expand our great selection of terrain even further in 2014. As for Battleground’s plans in the immediate future, I will say that 2014 will lead to some vigorous growth. Our ability to service the gaming needs of New England will continue to expand and our focus on providing our community with the best possible gaming environment, service, and selection will continue to improve in the way you’ve grown accustomed to expect. On behalf of the entire Battleground Games & Hobbies team, I want to wish you all a Happy New Year. 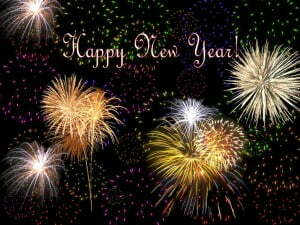 May you fill the next 365 days with more fun and games than any human life should conceivably allow! On behalf of the entire staff here at Battleground Games & Hobbies, we would like to wish you all a very happy and safe New Year! Share in the new year with us: Both conveniently located Battleground Games & Hobbies locations will be open regular store hours today, for your convenience. We have many exciting treats planned for 2014, beginning with an important change to our store credit policy. Stay tuned as we announce even more events and important changes. Plus, look forward to even more extensive changes to our website, coming this year! Get Behind the Shield.